Feel divine comfort in this Maison Du Soir™ Isabella Robe. V-neckline with floral print throughout. 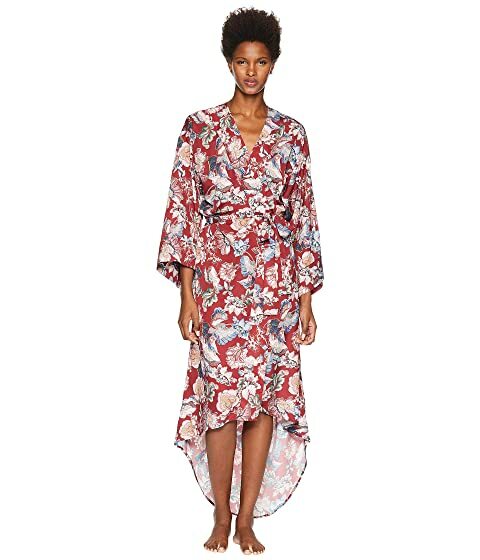 We can't currently find any similar items for the Isabella Robe by Maison Du Soir. Sorry! I love this robe, it’s my absolute favorite! I could have easily gone with the XS and had plenty of room but I did not want to hassle with sending it back or waiting for the smaller size! It’s a little big but robes weren’t meant for a tight fit! The colors are beautiful and vibrant, you really do feel beautiful wearing it! I absolutely love the Isabella robe, it’s my most favorite! I got a small, I probably could have gone with an XS but robes are supposed to be a little but bigger for the comfort factor. This robe is a beautiful color and I love the high low and how it flows when you walk! I can’t wait to buy another! This robe is gorgeous. It’s light and flowy. I’m 5’7 and I liked the fit of the XS better than the S. The sleeves on the small were longer and covered my hands, so cooking/washing hands was more difficult. The XS fit perfect and still almost touches the ground in the back.